The current two-part story from Doctor Who began last weekend with “The Zygon Invasion”. Although it’s a story about shape shifting aliens, there was a very strong social message to be taken from the programme which is highly relevant. I might even suggest that the story is the most topical Doctor Who has ever been. If you haven’t seen the episode, you’re most likely thinking how on earth can shape-shifting aliens be highly topical? Well, if you haven’t watch the episode and don’t want to have the plot spoiled, PLEASE AVERT YOU EYES NOW. This post contains MAJOR spoilers. 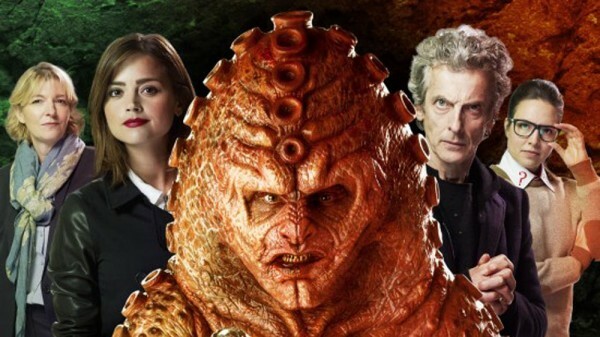 The cast of “The Zygon Invasion” (from L-R): Jemma Redgrave, Jenna Coleman, Peter Capaldi and Ingrid Oliver. The episode focuses around the Zygons, who were last seen during the 50th Anniversary special, almost two years ago. The special ended with an uneasy peace between Zygon and Humans with Zygons taking the form of humans and living peacefully amongst us. However, in this story the peace has broken down. There is a group of rebel Zygons who have begun to locate all Zygons and execute any who do not follow their plan for a full scale invasion of Earth and eliminate the humans. However, there were some serious political and social messages about the current refugee crisis and the problem of Islamic State. Initially, the videos of Osgood being forced to communicate with the Humans against her will were reflective of those which ISIS used to communicate with the West using their hostages. On the videos, we also witness the execution of two Zygons who had been peacefully living with humans. We’ve seen (at least not personally, but heard of) similar videos of ISIS carrying out these executions for those who refuse to follow its ideology. The overriding message from this and the resulting actions appear to be one of both caution and acceptance. There’s an extremely harrowing sequence involving UNIT soldiers attempting to shoot Zygons who take the form of their family members. One of their mothers (fake mother that is) pleads not to be executed and of course the soldier obliges out of guilt. For me, this is a message that family members shouldn’t be afraid to confront those who may be taking part in such activities. It’s certainly a tale of caution for those parents and family members of people who find themselves drawn to ISIS or other extremist causes. Secondly, the main objective of the Doctor throughout the episode is one of peace and trying to keep the Zygons living amongst humans without any issues. I interpreted this action as the people here in the Western world needing to be accepting of the people who are migrating from the war torn countries, and must attempt to integrate them into society and live peacefully. The story in the episode about Zygons killing humans in the American town after being segregated and isolated is a warning to the audience. We must not segregate and isolate these people because at the end of the day, they simply want to live peacefully. They may be different, but we must become more inclusive otherwise if we allow them into our country and treat them as alien, we might suffer the consequences of our actions. Finally, and this is major spoiler time and therefore your final warning, the whole situation of Clara secretly being a Zygon impersonator was fantastically portrayed and I interpreted it again in the current context. For me, it suggests anybody could be working against our free society. Clara is a figure everyone trusted and wouldn’t have expected to be ‘evil’, however, this is reflective of the fact that naturally good people can be taken in by the extremist propaganda and that we must be wary of this. I hope you enjoyed reading my thoughts about this week’s Doctor Who story. It was an incredible episode filled with twists, action and drama and most certainly worth watching if you haven’t already. I’m certainly looking forward to seeing the concluding part to the story tomorrow and hope you will be watching too!